PsyMP3 is an extremely simple audio player. Its functions are controlled through keyboard shortcuts and comes with limited functionality. However, the reason why I wanted to write about it was that, it is designed in a way (with spectrum visualizations etc), well, it’s a pleasure to use :). But again, please remember that this is a pretty basic audio player so it won’t help much while managing large audio albums by any means. It’s an open source, cross-platform player which is supposed to support GNU/Linux, Mac OS X and Windows but still only supports the MS Window platform & Free BSD. According to the developer GNU/Linux and other platform support might never exist (shame :/). It supports adding songs to playlists, but as said before, not ideal for managing audio albums. *. Supports playing audio formats such as: MP3, OGG Vorbis, FLAC, and WMA. *. It won’t let you save your playlists but you can however load a saved playlist at least. *. 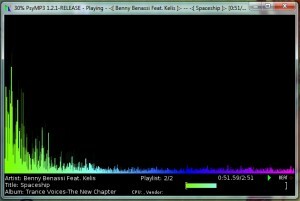 When playing files, on its window, you’ll see details such as: a beautiful spectrum visualizations (won’t take much off your CPU), song name, album, title, current playback audio track number in your playlist, total duration and current position. i -- For adding a new track to the playlist. l -- Adds a new track to the playlist, temporarily. Space bar -- Play/Pause current playback. Right/Left (arrow keys) -- For fast forwarding and rewind playback. b -- Turn on/off repeat track. z -- Turns on the spectrum FPS (frames per second) counter. s -- Turn on/off spectrum. a -- Displays the “About” dialog. q -- Exits the player. *. Supports sending “Now Playing” to MSN and pidgin messengers (I did not test them as I don’t use them). *. Supports playback controlling via front-ends written for Winamp such as: Foxitunes Firefox toolbar and Winamp tool-bars etc. It’s also portable since no installation is required. Just download its zipped archive from this PsyMP3 home page and extract its content to somewhere. Whenever you want to run the player, go to the extracted folder and double click on the file called “psymp3”. That’s it. Other than those issues, for an extremely simple and highly portable audio player, I think PsyMP3 is a pretty elegant app nonetheless. Nice write-up. I'm going to link to here from the PsyMP3 project page. I know about the crashing issue, but I could never track down exactly what caused it. I'm going to rewrite the whole thing from scratch. I might issue a few bug fixes for the old version up on the site, if I may any headway. As for the Winamp integration… I had an old Winamp 2.x era systray controller, that placed a configurable number of icons in the system tray, and had a pop-up notification on track change. After verifying that it ran nicely with Winamp 5, I checked a number of code examples that grabbed data from Winamp, and then wrote code to make PsyMP3's guts look like Winamp to these apps. Once the controller app (and subsequently, FoxyTunes) pulled data well, I was happy. Oh, it also fakes the KVIrc plugin for Winamp well enough that the music functions in KVIrc work well enough. Check out this video I did of the 2.x version I'm hacking away on: http://www.youtube.com/watch?v=cmkZaFZ5Siw – It's not even an alpha. No GUI stuffs at all, you gotta start it from a commandline, and once the song is done, it just sits there. Gotta get a playlist implemented. First of all, thanks for the comment (it kinda out performed my own post!, lol :D), appreciate the additional info. Secondly, yes, you gotta make it stick there 😉 (after reaching the end of the playlist), which I think would be really welcomed by the users. And about that WinAmp reverse engineering work, nice!!. Thirdly, the new version looks good (glad to hear that it needs even less resources), and if you could release the 2.0 for GNU/Linux too, especially Ubuntu (my humble request), that would be even better. Again, thanks for the comment (and "the link" ;-)), appreciate it. There's nothing at all in the 2.x code that would keep it from running on the various free Unixes. The Windows version is currently cross-compiled from a FreeBSD box using the mingw32 port of gcc. The only OS that I can't guarantee good results with at this point is Mac OS X. I don't own a Mac to flesh out Mac-specific features with, nor do I have any experience in Objective-C. The page wouldn't show any images (says 'Domain unregistered at …'). But from the text, I can see that there's a screenshot that you've taken from Ubuntu! !, great. Keep up the good work.